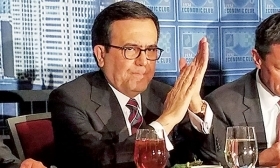 Mexican Economy Minister Ildefonso Guajardo said such a border tax would "very likely" violate World Trade Organization rules. Country-specific rules of origin within the North American Free Trade Agreement (NAFTA) would be "totally unacceptable," and a U.S. border adjustment tax would likely violate global trade rules, Mexico's economy minister says. Under the trilateral trade deal between the United States, Mexico and Canada, rules of origin can specify that products, such as new vehicles, must meet minimum regional (NAFTA-wide) content requirements to be tariff-free, but there are no national content requirements. It’s a hugely important regulation to the auto industry, in which vehicles contain parts from any number of countries, including the three bound together in NAFTA. "In no trade deal, whether bilateral, trilateral or multilateral, has there ever been any precedent treaty of rules of origin by country. It would be totally unacceptable," Mexican Economy Minister Ildefonso Guajardo told reporters at an event in the northern Mexican city of Monterrey on Friday. Mexican officials have said the administration of U.S. President Donald Trump could try to push for national content requirements in a revamped NAFTA to boost jobs at home. Trump has said the NAFTA deal has given Mexico "unfair" advantages and he wants to cut the U.S. trade deficit with Mexico. Canada is manufacturing 2.3 million vehicles a year, on its way down to two million vehicles a year, while Mexico is on track to produce four million vehicles a year, Dias said. Trump is expected to submit his plan to renegotiate NAFTA to U.S. lawmakers soon. Guajardo said talks to renegotiate NAFTA should move ahead regardless of the timetable for a U.S. tax reform. Trump wants to cut corporate income tax rates and Republicans have proposed a border adjustment tax that favors exports over imports. Guajardo said such a border tax would "very likely" violate World Trade Organization rules. Mexico sends nearly 80 per cent of its exports to its northern neighbour and a U.S. border tax could slow factory growth in Latin America's No. 2 economy. Germany's economy minister on Friday said her country could file a lawsuit against the United States at the World Trade Organization over the border tax ahead of a meeting between Chancellor Angela Merkel and Trump.